Immortal Heart by tatmom. After a few tries I was finally able to get this to look right anc complete it. I think I have an extra picot somewhere in there but can't seem to find it in the pic. Now I am trying to learn the single shuttle split ring. It is certainly a challenge. I have figured out where to tat after I make the ring for the shuttle but have not mastered how to close the ring when I finish tatting. I will master this as I really want to make AnneB's Ringtrim dragon and the others as well. They are just to cute. I won't be getting much tatting done after Tuesday as that is when my sister (Miss Piggy) comes home for the week. I know we will be busy all week. Plus my baby sister is planning on comming for the weekend. Dad will have wall to wall bodies at his house as his living room is so much smaller than mine. Oh well, everyone wants to hang out there so it will be all right. We are going to have a SuperBowl party Sunday night. I wonder how that will be. I don't watch football so I may just take over a book to finish. 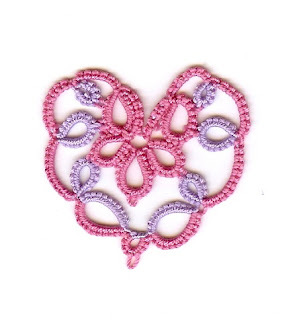 I am going to the Online Tatting Class first to see what is being taught and maybe I will take that to practice on. What a very sweet heart! I love the colors that you used. I don't see any extra picot. All I see is a very pretty heart! And I also love the color combination!